I figured I would give this baked flounder with cheese sauce a try, having never made flounder (or really, anything else) in a cheese sauce. This recipe is pretty simple and straightforward - season the flounder, bake, and pour sauce on top. I also sprinkled some additional cheese on top just for fun! I was a bit nervous making the sauce because I had never made a sauce starting off with butter and then adding flour and milk, but it was both simple and quick! I just swirled the pot around a bit, and that's all it took. Yay for not having to clean another utensil! If I were to make this flounder again, I would probably add a bit more lemon juice and possibly some other herbs (maybe rosemary?). Although this version is not bad, some extra flavor is always welcome! What's your favorite way to prepare flounder? Make a paste with the onion powder, lemon juice, celery seeds, salt, pepper, and any other herbs or spices desired. Place fillets in a baking dish and spread paste on top. Bake at 400F until almost flaky. Make sauce by stirring flour into melted butter and adding milk and cheese. 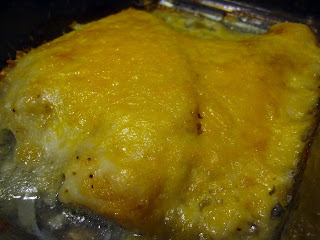 Pour sauce over fish and sprinkle additional cheese on top, baking again until fish flakes.